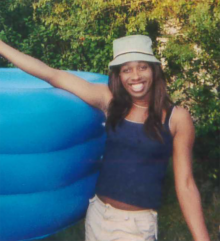 Ashley Diamond is suing the Georgia Department of Corrections, saying she was denied hormone therapy for three years while being held at a men's prison. The case has caught the attention of the U.S. Department of Justice. The U.S. Department of Justice has weighed in on a lawsuit filed by a transgender inmate in Georgia, arguing that an inmate’s gender condition should be treated as any other medical condition. The inmate, Ashley Diamond, said she’s been denied hormone therapy while being held in a men’s prison since 2012 and has been sexually assaulted several times. A hearing for the case has been set for Thursday in federal court in Macon, Georgia. The Southern Poverty Law Center filed suit on Diamond’s behalf in February against the Georgia Department of Corrections. The Justice Department, in a brief last week, said failure to provide individualized medical treatment for gender dysphoria violates the Eighth Amendment’s prohibition on cruel and unusual punishment. The Department of Justice’s intervention in the case is historical, said Chinyere Ezie, a staff attorney at the Southern Poverty Law Center and a lawyer for Diamond. “We think it sends a really clear message that there are real constitutional duties at play when it comes to providing hormone therapy and other forms of treatments to inmates who are transgendered,” Ezie said. The Department of Corrections has not commented on the lawsuit. Diamond, who’s now 36 years old, has had hormone therapy since she was 17, the lawsuit says. “This is more than just about hormone care. This is about gross human rights violations. Three years of torture is enough,” Diamond said in a YouTube video last summer. The Justice Department said it didn’t take a position on the factuality of Diamond’s claims, but also called into question “freeze-frame policies” in which inmates are allowed only the level of treatment before imprisoned.